Continued aftershocks where the tectonic plates made the ground shake for days until Kathmandu had moved three meter to the North and Mt. Everest a few centimeter upwards. Out of around 35 temples, shrines, columns and statues on Durbar Square nine monuments have crumbled and vanished into rubble. Among them Maju Deval, the former 'character site' on the square, where only the nine-stage platform remains. Also the 12th century Kasthamandap Temple has been destroyed. To the SE of Durbar Square the 62 m Bhimsen Tower (Dharaha), severely damaged in 1934, is now all down with 180 people being killed in its falling. Many structures, one third of total number, are now supported by heavy timber supports (tekas) among them Degutaleju Temple, Kumari Ghor, Taleju Temple and Vishnu Temple. Basantapur (Kathmandu) Tower has lost its three top floors. Other temples, almost half of total number, have escaped undamaged: Jaganath Temple, Kabindrapur Temple, Ashok Binayak, Bhagwati Temple, Mahendreshwar Temple and many others. The collection at Patan Museum, inaugurated 1992 in the former Royal Palace with one of the finest exhibitions of religious art in Asia, is undamaged. Other parts of the entire palace complex have been hit and roofs have fallen. On Durbar Square the Garuda Statue on column is standing. King Yoganarendra Malla's statue is down, and the legend has it that as long as the bird on top remains, the king may still return to his palace. Krishna Mandir and Krishna Temple are both intact. The upper timber structures of Vishwaranath and Bhimsen temples are being supported by timber. The three-tiered Hari Shankar Temple is all down. Taumadhi Tole: Nyatapola Temple, the tallest in all Nepal, had only minor damage in the 1934 earthquake (the upper storey rebuilt). Its construction was so sturdy that no damage happened in 2015: All five stories are standing. Bhairabnath Temple had a third level added after 1934 earthquake and was left largely undamaged in 2015. Til Mahadev Narayan Temple, one of the oldest temples in Bhaktapur on a site in use since 1080, is undamaged. Durbar Square: Northern half of the square is the Royal Palace with only few of its 99 courtyards surviving the 1934 earthquake. All buildings are still standing after 2015 earthquakes, but damaged and supported. Char Dham Temples, Pashupatinath Temple and Taleju Temple are all intact. Vatsala Durga and Fasidega stone temples are both down. 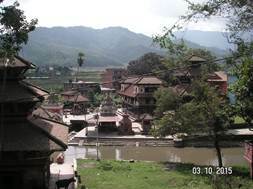 Tachupal Tole: Dattatreya Temple and Bimsen Temple are both intact. Pujari Math (Hindu priests' houses) with the now closed Woodcarving Museum and the Peacock Window (finest in the valey) have damaged brickwork. Extensive damage on houses in the backstreets around Tachupal Tole, being the oldest part of Bhaktapur. Plinth and dome intact. Square tower with eyes (harmika) had severe cracks following second earthquake (6.9) and had to be removed together with the three tiered spira and top umbrella. Now under reconstruction. 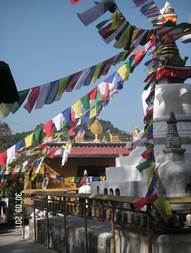 Houses around the stupa were supporting each other during the earthquakes, unlike in Swayambhunath. Stupa is standing undamaged, with its gilded square tower and 13-tiered top structure and umbrella. Pratapura Temple is damaged at its base but is standing supported. Anantapura Temple has its base standing but upper part has fallen. Hariti (Ajima) Temple is undamaged. Museum of Buddhist Statuary is intact but supported. Shree Karmaraja Mahavir has been totally damaged and all three storeys below hilltop level have with its three storeys overground fallen down the hillside. Dongak Chöling Gompa has been severely damaged and what remains is only standing supported. Shantipura too is damaged and supported. The harmonious row of buildings surrounding the stupa has been severely broken. Pashupatinath Temple is undamaged and so are the Cremation Ghats. On top of the hill Goranak Temple's shrines with their stone carvings together with lingams and maths have been damaged. The exquisite main temple, destroyed and rebuild four times, is presently supported with heavy timber on all four sides. The brickwork at Bhairab Shrine has been damaged and the shrine is supported by timber. Chhinnamasta Temple is undamaged, and so is the oldest stone inscription in the valley dating from AD 464. The monks' maths are heavily hit, and the museum has been damaged thoroughly. A granny and two children died here during the disaster. Nationwide 8.900 people died and 22.500 were wounded in April 2015. More than 600.000 buildings are destroyed totally, and 285.000 are partly damaged. Department of Archaeology estimates that on a nationl level 133 historical monuments have been totally destroyed, 95 have partly collapsed and 513 are partly damaged. Around Kathmandu 95 monuments are totally destroyed and 357 are partly damaged. On Durbar Square nine monuments collapsed and 26 were partly destroyed. It is estimated that the entire reconstruction of all seven World Heritage Sites is likely to cost in the region of US$ 100 million and last 5-7 years. BUT: Not All Is Gone! The whole Kathmandu Valley is a living monument with little visited treasures, like the Namo Buddha Stupa south of Dhulikel and nearby Panauti, aspiring to be number eight World Heritage Site in the valley. More information to be found on wikipedia etc. Tourism is said to be down to 25% of normal activity at this time of year. Following the April earthquakes many Nepalese took up loans for rebuilding their houses. Now they are hit again by a fuel crisis caused by Indian blocade and unrest in the Terai due to the new constitution. Leading to blocked highways with lines of buses and cars waiting for hours to pick up their ration at petrolpumps, soaring taxi fares and lack of cooking gas. Airplanes flying out of KTM may have to refuel in Lucknow or other Indian cities. So now is indeed the time to go, if you want to support this living museum of Newari and Tibetan culture. Five times I've visited Neal since 1973. And it is still a wonder to experience.